The American Scoter ranges along the whole coast of our Atlantic States, in the latter part of autumn and during the winter, extending as far southward as the mouths of the Mississippi, beyond which I have not observed it. A few pairs breed on the shores of Labrador, but the great body of these birds proceed farther north, although the limits of their migration in that direction are as yet unknown. On the 11th of July, 1833, a nest of this bird was found by my young companions in Labrador. It was placed at the distance of about two yards from the margin of a large fresh-water pond, about a mile from the shore of the Gulf of St. Lawrence, under a low fir, in the manner often adopted by the Eider Duck, the nest of which it somewhat resembled, although it was much smaller. It was composed externally of small sticks, moss, and grasses, lined with down, in smaller quantity than that found in the nest of the bird just mentioned, and mixed with feathers. The eggs, which were ready to be hatched, were eight in number, two inches in length, an inch and five-eighths in breadth, of an oval form, smooth, and of a uniform pale yellowish colour. I afterwards found a female with seven young ones, of which she took such effectual care that none of them fell into our hands. On several occasions, when they were fatigued by diving, she received them all on her back, and swimming deeply, though very fast, took them to the shore, where the little things lay close among the tall grass and low tangled bushes. In this species, as in others, the male forsakes the female as soon as incubation commences. This bird usually flies low over the water, although its flight is swift and well sustained. On land it moves more awkwardly than the Eider Duck, but in diving it is perhaps superior to that species. During their stay along our shores, they congregate in vast multitudes, and being often shot on wing in numbers, are sold in all the markets of our maritime cities; but their flesh is very dark and has a strong fishy flavour, so as to be very unsavoury. It sometimes happens that during violent gales the Scoter is forced into freshwater rivers, from which, however, it returns to the salt bays, inlets, or outer sandy shallows of the coast, as soon as the weather permits. They are extremely abundant about Boston, New York, the New Jersey shores, and the Chesapeake; but less so to the southward, until you reach the salt lakes about New Orleans. Their food consists of shell-fish of small size, marine plants, and insects. The difference between this species and the European bird of the same name, Fuligula nigra, being now well known, it is unnecessary to say any thing on the subject. I have given figures of the adult male and female, but am not acquainted with the changes which the plumage undergoes. The young are covered with pure black hair-like down. In the winter season, at which time the male in the plate was drawn, the colour of the bill is much less bright than in spring, or during the period of breeding, when the males, after they have left the females, associate together in parties, and moult in August. 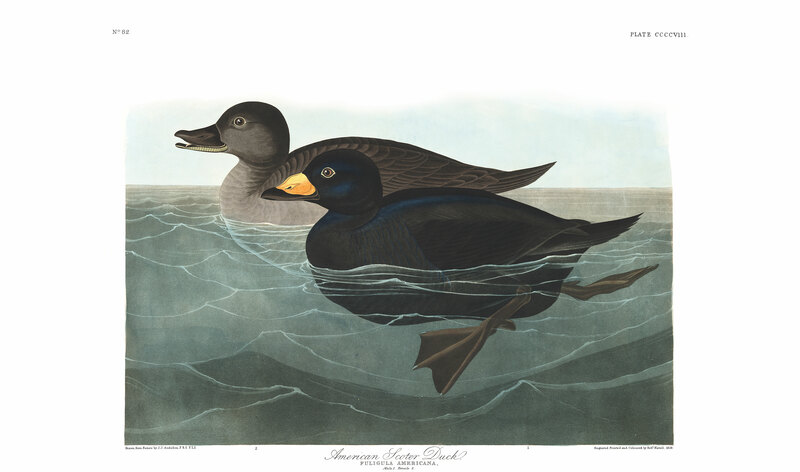 It has been supposed that we have two species confounded under the common name of Scoter; but I have not succeeded in finding more than one, and my zealous young friend, Dr. THOMAS M. BREW, of Boston, who is quite competent to the task, has been equally unsuccessful, although in the course of the last two years he has examined a great number of individuals. SCOTER DUCK, Anas nigra, Wils. Amer. Orn., vol. viii. p. 135. FULIGULA NIGRA, Bonap. Syn., p. 390. OIDEMIA AMERICANA, Swains. American Scoter, Swains. and Rich. F. Bor. Amer., vol. ii. p. 450. AMERICAN SCOTER DUCK, Fuligula americana, Nutt. Man., vol. ii. p. 422. AMERICAN SCOTER DUCK, Fuligula americana, Aud. Orn. Biog., vol. v.p. 117. In winter abundant in the Bays of Boston, New York, and Chesapeake, and as far south as the mouth of the Mississippi. Never inland. Breeds from Labrador to the Arctic seas. Bill a little shorter than the head, very broad, higher than broad at the base, much depressed toward the end, which is semi-elliptical. Upper mandible with the dorsal outline convex at the base, descending and concave in the middle, again convex toward the end; the basal part tumid with a median groove, the ridge broad and slightly convex between the nostrils, the sides at first nearly erect and concave, gradually becoming more depressed and convex, the sides soft, internally lamellate, nearly parallel for half their length, dilating a little to beyond the nostrils, then contracting; the unguis very large, broadly elliptical. Lower mandible flattened, with the angle long and rather narrow, the dorsal line slightly convex, the edges parallel, the tip rounded, the unguis very broadly elliptical. Nostrils medial, elliptical, pervious, near the ridge. Head large, oblong, compressed, rounded above. Eyes of moderate size. Neck short and thick. Body large and much depressed. Feet very short, placed rather far behind; tarsus very short, much compressed, having anteriorly in its whole length a series of small scutella and above the outer toe a partial series, the rest covered with reticular angular scales. Hind toe small, with a free membrane beneath; anterior toes nearly double the length of the tarsus, connected by reticulated membranes having a sinus on their free margins, the inner with a lobed marginal membrane, the outer with a thick margin, the third and fourth about equal and longest. Claws small, that of the first toe very small and curved, of the middle toe largest, with a dilated inner edge, of the rest slender, all rather obtuse. Plumage soft, dense, blended, slightly glossed. Feathers on the head and neck of a velvety texture, being very small, oblong, with the terminal filaments disunited. Wings rather short narrow, and pointed; primary quills curved, strong, tapering, pointed, the first with the inner web cut out towards the tip, leaving the feather less than a quarter of an inch in breadth at the distance of an inch and a half from its extremity; the second longest, exceeding the first by half an inch, and the third by one-twelfth, the rest rapidly graduated; secondaries broad and rounded, the inner elongated and tapering. Tail very short, graduated, acuminate, of sixteen pointed feathers. The bulging part of the upper mandible is bright orange, paler above, that colour extending to a little before the nostrils; the rest of the upper mandible, including its basal margin to the breadth of from three to two twelfths of an inch, black, as is the lower mandible. Iris brown. Feet brownish-black. The general colour of the plumage is black, on the lower parts tinged with brown; the inner webs of the quills brownish-grey. Length to end of tail 19 inches, to end of wings 17, to end of claws 20; extent of wings 33 1/2; bill along the ridge 1 11/12; wing from flexure 9 4/12; tail 4; bare part of tibia 4/12; tarsus 1 9/12; hind toe (8 1/2)/12, its claw (2 1/2)/12; second toe 2 2/12, its claw 4/12; third toe 2 9/12, its claw (5 1/2)/12; fourth toe 2 11/12, its claw (3 1/4)/12. Weight 2 lbs. 9 oz. The female, which is a little smaller than the male, has scarcely any protuberance at the base of the bill, which is entirely brownish-black. The upper parts are of a light sooty-brown colour, the lower light brownish-grey. Length to end of tail 17 inches; extent of wings 29 3/4. This species differs very little from the European Scoter, being nearly of the same size, proportions, and colours. The male differs from that of the other species in having the sides of the unguis narrowed, and the orange patch on the upper mandible less extended beyond the nostrils, and destitute of the median black line and lateral streak. There is less difference in the colour of the plumage however, than has been represented; for adult males of this species are not sooty-brown above, but deep black. An adult male, from Dr. T. M. BREWER, Of Boston. The roof of the mouth is very concave and broad, with a median ridge, on which there are six papillae towards the base. There are about 25 large lamellae on each side of the upper mandible, besides a number of smaller ones anteriorly; about 40 on each side of the lower mandible. The tongue is 1 inch 10 twelfths long, its greatest breadth 9 1/2 twelfths; the papillae at the base long and pointed, the sides furnished with two rows of bristles, the tip thin-edged and rounded. The aperture of the glottis, and that of the posterior nares, are beset with minute papillae. The oesophagus is 10 1/2 inches long, of moderate width, its greatest diameter being 10 twelfths; that of the proventriculus 1 inch. The stomach is a strong gizzard of moderate size, 1 1/2 inches in length, and 1 inch 10 twelfths in breadth; its left lateral muscle 10 twelfths in thickness, the other 9 twelfths; the epithelium tough, dense, forming two roundish slightly concave grinding surfaces. The proventricular glandules, which are rather small, of a roundish form, 1 1/2 twelfths long, form a belt 1 1/4 inches in breadth. The contents of the stomach are particles of quartz. The intestine is 4 feet 11 inches long, rather wide, its diameter pretty uniform, and about 4 1/2 twelfths. The coeca, which come off at the distance of 4 inches from the extremity of the gut, are 8 inches in length, 2 1/2 twelfths in their greatest diameter, with the extremity obtuse. The trachea is 6 1/4 inches long, flattened, its breadth 5 twelfths, contracting at the lower part to 4 twelfths. Its rings are but partially ossified, being cartilaginous at the back part. It is entirely destitute of those remarkable dilatations seen on the trachea of Fuligula perspicillata and F. fusca. The bronchi, however, are of very large size, being 1 inch 4 twelfths long, their greatest breadth 1/2 inch. The inferior larynx is very small, being only 3 1/2 twelfths in breadth, in which respect it differs from that of most other male Ducks. It is indeed very remarkable that this species, so nearly allied to the Velvet and Surf Ducks, should present no dilatations, either at the upper larynx, or in the course of the trachea, as are seen in them. This fact is one of many tending to shew that the strictest affinity in some points of structure is not always accompanied with a strict resemblance in some of the organs supposed to exhibit generic peculiarities. The trachea of the male of this species merely resembles that of the female of the other species. Its rings are about 100; those of the bronchi 30. The contractor muscles are strong, and terminate at the commencement of the lower larynx. There are cleido-tracheal and sterno-tracheal muscles, but no inferior laryngeal.